Lt. Gov. Byron Mallott went to Bethel last week to talk about what the Alaska Native Linguistic Emergency Administrative Order can do. He also took a moment to recognize public broadcasting’s John Active, who made major contributions to keeping language alive in the Yukon-Kuskokwim Delta. August 18, 2017. As the ink dried on Gov. Walker’s signature finalizing the Alaska Native Linguistic Emergency Administrative Order, Lt. Gov. Byron Mallott went to Bethel to speak about what the order can do. He also took a moment to recognize public broadcasting’s John Active, who made major contributions to keeping language alive in the Yukon-Kuskokwim Delta. Lt. Gov. Mallott says it all started back in 2014, when Alaska officially recognized it’s 21 Indigenous languages, including Yup’ik. That paved the way for the legislative resolution passed in April urging the governor to declare a linguistic emergency for Alaska’s Native languages. “The governor received it. Agrees fully with the reasoning behind and signed in Juneau an administrative order, which itself has the force of law,” said Mallott. That instruction stands until another governor overturns it, added Mallott. The order says that the state must do all that it can to preserve and support language revitalization efforts. “All state agencies, all departments of the state of Alaska should work with tribes on a government to government basis, recognizing the sovereignty of those tribes,” Mallott said. The Department of Education and Early Development is the lead agency in responding to the emergency, says Mallott, and each officer of the governor’s cabinet will need to designate a point person. State signs will also change. 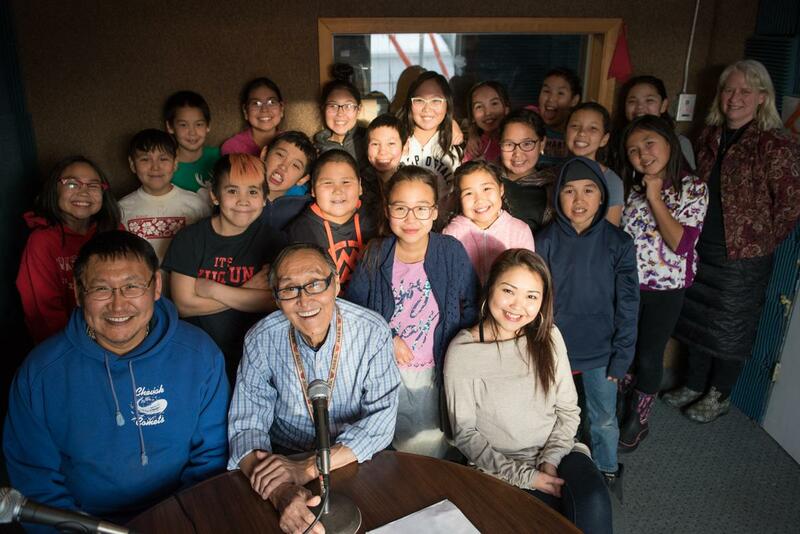 John Active (center) with students from the Yup'ik immersion school Ayaprun Elitnaurvik in October 2017. Photo taken at KYUK studios in Bethel, AK. The Alaska Native Language Preservation and Advisory Council will continue to play a role in making specific recommendations to the governor. Mallot says that the administration will continue to work to find additional resources to protect and revitalize Alaska’s Indigenous languages. “The state is prepared to work with the legislature to do whatever is fiscally responsible to meet this emergency,” Mallott said. Unlike other Native languages in Alaska, the Yup’ik language is spoken on a regular basis. One of the advocates for the language worked at KYUK for decades. 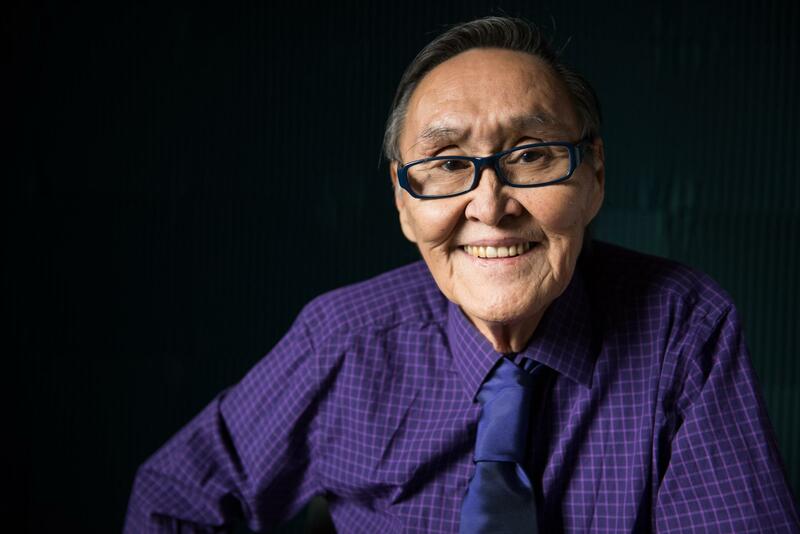 Before he died this summer, John Active did everything from reporting and reading the news in Yup'ik, to telling stories, conducting call-in programs, and talking with Elders in Yup’ik. He helped shape a radio station where local programming was translated and conducted in Yup’ik because he was passionate about keeping the language vital and saw radio as a tool. 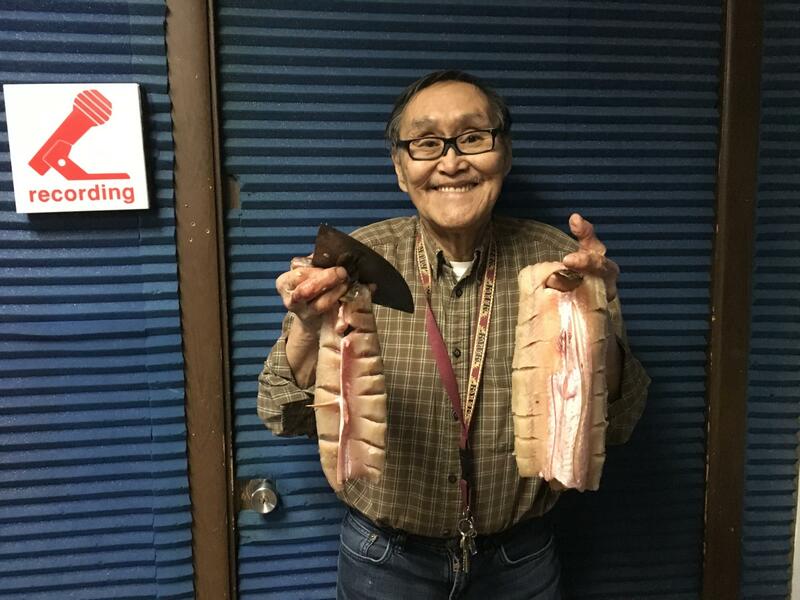 Locally, Active made sure listeners heard different dialects of Yup’ik, representing upper and lower Kuskokwim river communities as well as coastal communities. “You should be proud, proud to hear a little Cup’ik, a little Mekoryuk, a little upriver,” Active said, speaking to class of students from Bethel Regional High School back in 2007. When outsiders came to report or shoot a documentary, Active pushed them to use people from the community as guides to better understand the region and improve the stories and films. The lieutenant governor took time to recognize Active’s legacy, pointing also to the Yup’ik people who worked to get the linguistic emergency officially recognized. John Active carving up some pike for a co-worker lunch at KYUK in 2017. Long before John Active became an Elder, he recognized the importance of getting Elder interviews on the air and archived. Before he died, he talked about why it was important to record and keep this oral tradition so cultural wisdom and history would not be lost. Thinking back on his memories of Active, the lieutenant governor reflected that it was his first time being back at KYUK since Active died. “He was such an incredible personality, such an incredible teacher of language, and I miss him very much and I know we all do,” says Mallott. John Active will be inducted into the Alaska Broadcaster’s Hall of Fame soon. Chris Ho and KYUK Reporter Krysti Shallenburger contributed to the reporting of this story.